An Intrinsically Safe version of the doseBadge, the CR:110AIS, is available which carried certification to ATEX, EEx, IECEx, FM (US & C) and SIMTARS. The CR:110AIS can be used in hazardous zones, for example in underground mines, petrochemical plants and other areas that require safe measurement equipment. Explosive atmospheres can be caused by flammable gases, mists or vapours or by combustible dusts and the CR:110AIS doseBadge is ideal for use in these types of environments. The doseBadge measurement kits are available with various quantities of doseBadges as well as all of the items needed for occupational and industrial hygiene noise measurements. The measurement kits can be expanded with additional doseBadges and charger units as required. These can be either standard CR:110A doseBadges or the Intrinsically Safe CR:110AIS. Optional items can be added to enhance the operation and use of the doseBadge Measurement Kit. 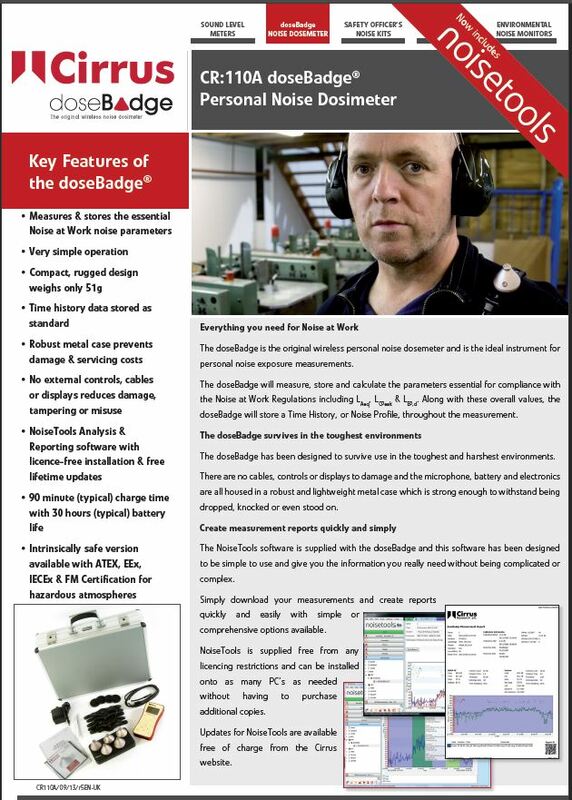 The doseBadge is available in a number of different versions, each with the features that make the doseBadge unique and the ideal solution for occupational noise measurements. CR:110A - The standard version with a silver case. Dual channel measurements. Supplied in a robust aluminium case (which is silver in colour) which protects the microphone capsule, battery and electronics inside the instrument. CR:110A/BLK - The same functions and features as the CR:110A but with a black case, ideal for law enforcement and musicians. CR:110AIS - The Intrinisically Safe version of the doseBadge with ATEX, EEx, IECEx, FM (C & US) and SIMTARS Certifications for Mining & Non-Mining. CR:112AIS - The Intrinsically Safe version of the doseBadge with MSHA Certification.